It was quite the detail indeed, and it was extremely satisfying to get the hood shining nicely again. I still need to do another round of paint correction on it, but I'll wait until I have some better detailing tools— the Harbor Freight DA is super noisy and rough on my hands. For now it looks pretty good. The funny thing is that I'm Russian as well. That was one of the first things Dario and I discussed on the phone when I initially called him, haha. Oxford Green all the things! Today was a good day! First I started out by cleaning the carpet that I got from the junkyard. My friend (also the guy I run the shop with) helped out with everything. The carpet was pretty nasty initially, with several sticky stains and just general filth. After some TLC with a shop vac and repeated scrubbing with Ammo Shag and a stiff-bristle brush, 95% of the grunge was gone. It's not perfect but it came out super nicely and is just right for a daily driver. 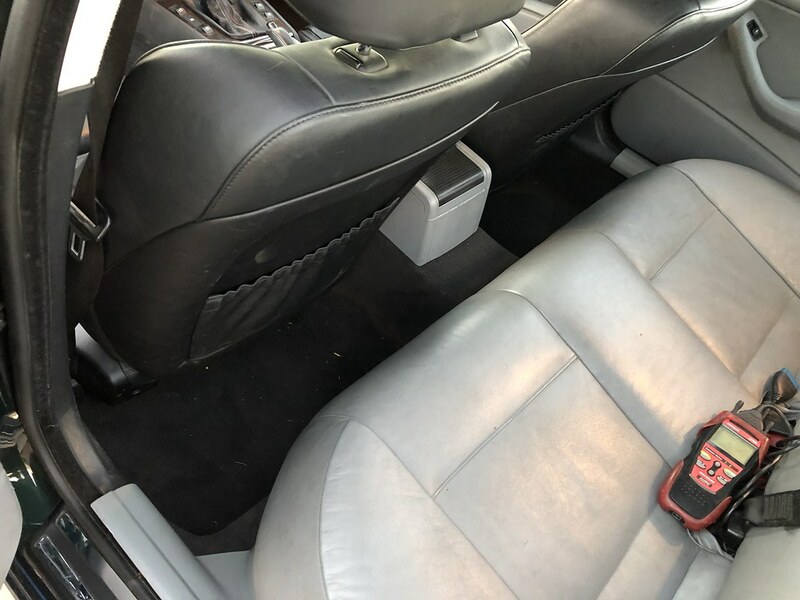 With the new carpet in, we reinstalled the center console, except with a black armrest that I had scored in my most recent junkyard run. It's much less creaky than the previous junkyard armrest that I had, so that's a win in my book. We also installed a black dead pedal and driver's side black kick panel. Next up was installing the X5 4.6is seats. 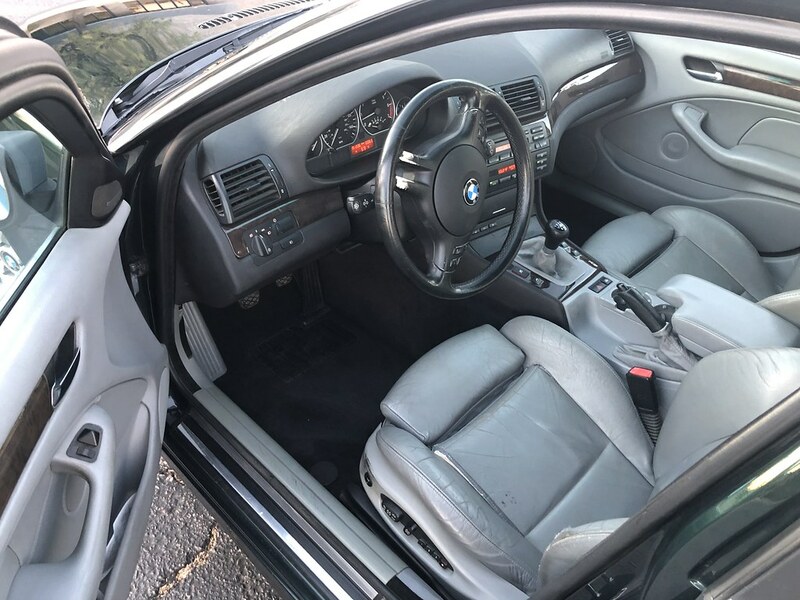 As some of you may know, the E53 and E46 use pretty much the same seats. 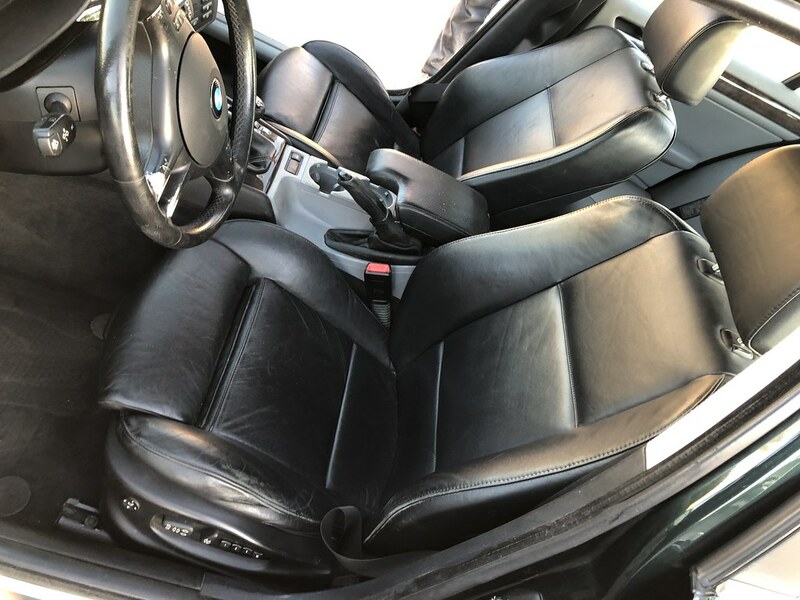 There's a slight visual difference with the head rests and bolsters (the X5 sport bolsters go all the way up whereas the E46 sport bolsters kinda stop halfway up the seat back), but electronically the seats are pretty much identical. 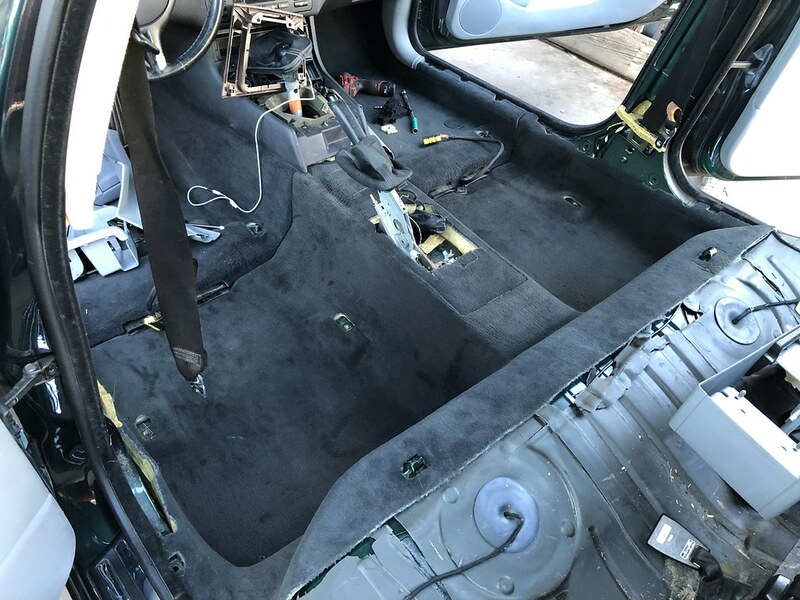 We chose to keep using the stock E46 seat belts, so we had to swap the seatbelt receiver/pre-tensioner from the E46 onto the E53 seat, since the E53 seatbelt receiver didn't work for the E46 seat belts. 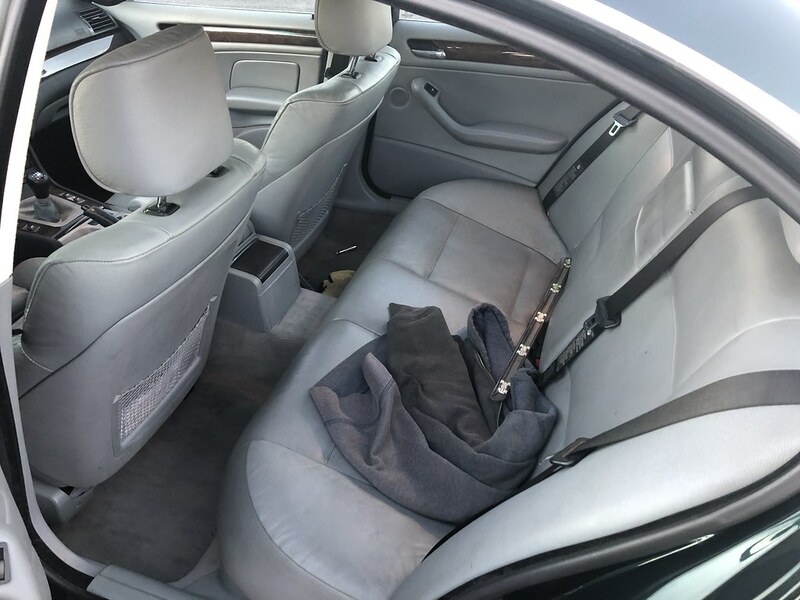 The actual wiring for the seatbelt receiver was identical, so it was a matter of tracing the wires to the main seat harness and disconnecting them. There was no actual wiring required, it was pretty much all plug-and-play. 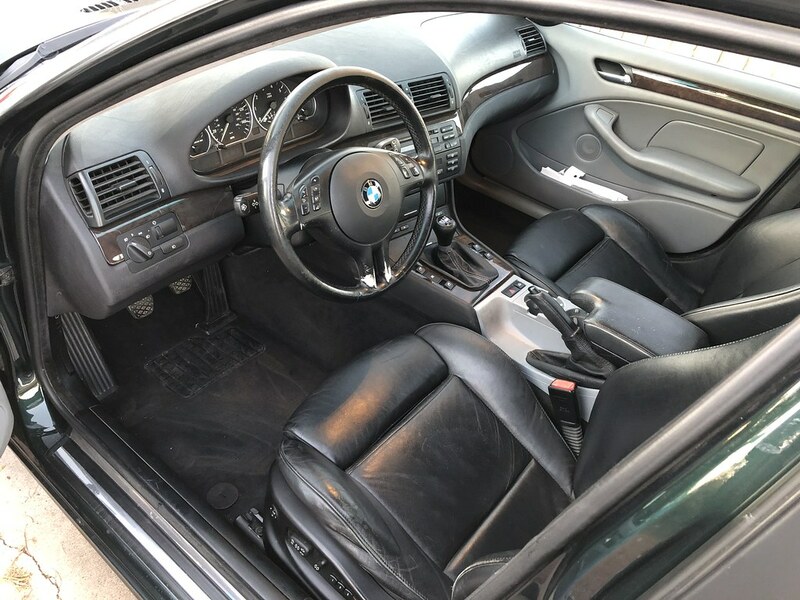 I'll make a post about it in the general section in case somebody wants to use E53 seats in their E46, since it seems like there's not a ton of info on the little differences between the two. The X5 4.6is seats are really comfortable, since they use a much softer grade of leather than the E46 seats. In a way, they hold me into the seat better since I'm not sliding around on hard leather. The best part is that literally everything works— I've got lumbar support, seat heating, seat memory, and all the usual power adjustments. I didn't give anything up, and I don't have any errors or airbag lights either. That's a win-win in my book! Nice work! 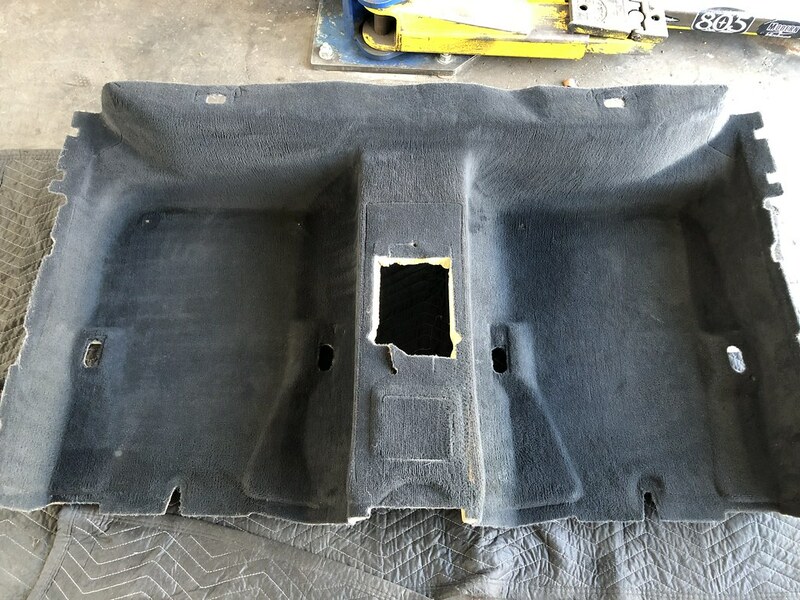 I would have thought that e53 seats would be pretty different...taller...i dunno... Should be easy to find a black leather or even vinyl rear bench in the junk yard to finish it out. I recognize that name from the E38 forum! Nice work and love the story. Thanks! Nah, the E53 seats are the same height, the floor is just raised in the E53 to make them sit higher. 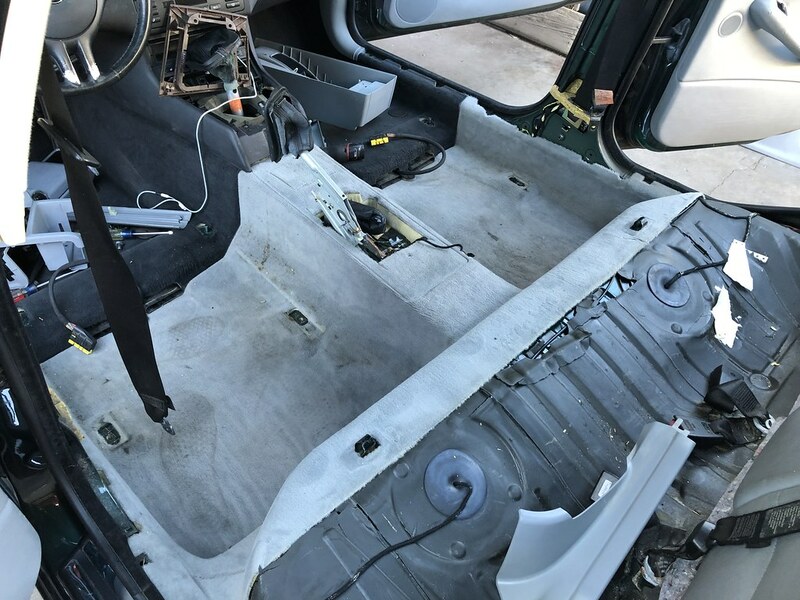 BMW really raided the parts bin for the E53 X5— E46 seats + E46-ish door panels, E39 cluster + electronics, E39 engines, E46 window switches, E39 HVAC, and so on. 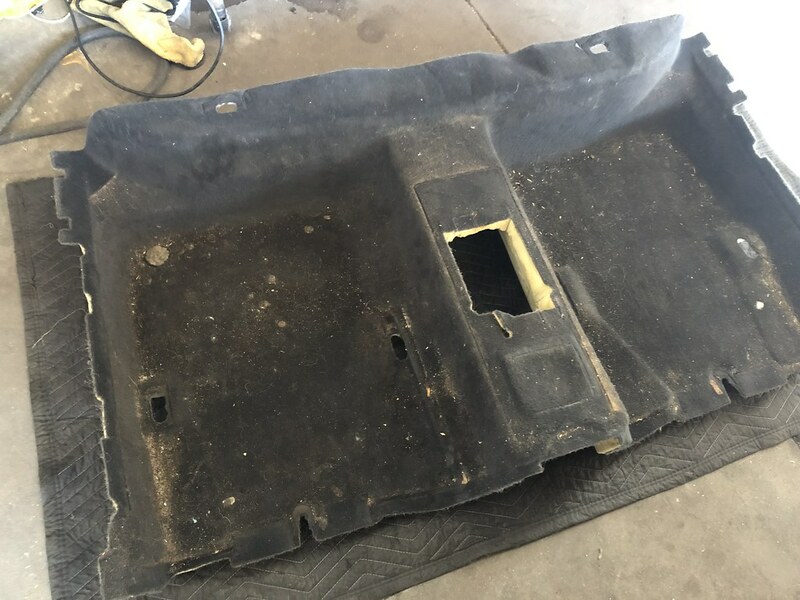 It's proving to be rather difficult to find a nice condition black leather back seat, all of the ones at junkyards are trashed/torn up by idiots trying to get to the fuel pump (the seat pops off, there's no reason to cut it open!) or they're leatherette which I don't want. I'll keep looking though, I'm sure a nice one will pop up eventually. Earlier today I went on a fun drive up north to Prescott, AZ with my friend. 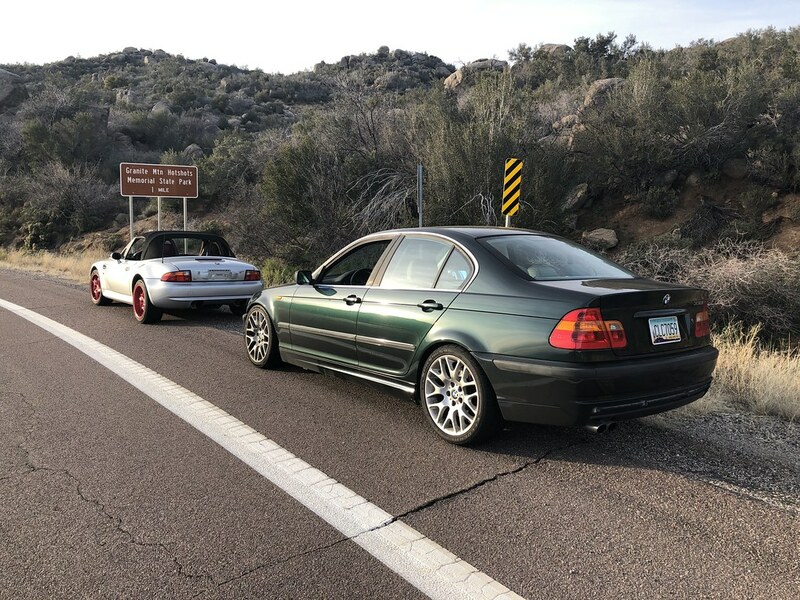 He bought a Z3 M-Roadster up there and I came along for the ride, mainly because there are a lot of fun driving roads up there. 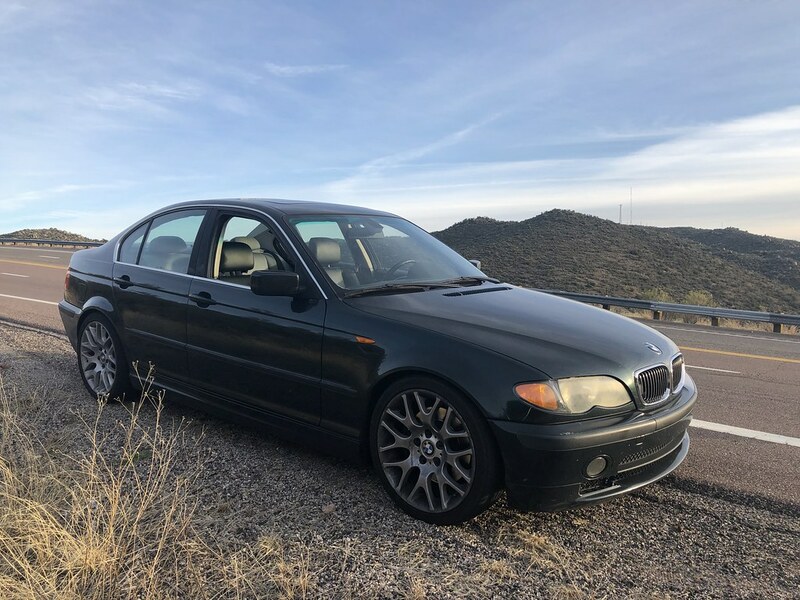 We took a super twisty route on the way back via route 89, it was fun to really push the 330i for the first time since I've owned it. I definitely need new front tires, but I had lots of fun nonetheless. The car would also benefit from some thicker sway bars to dial out some of the body roll in the tighter turns, but that'll be later down the line once the more important stuff is taken care of. 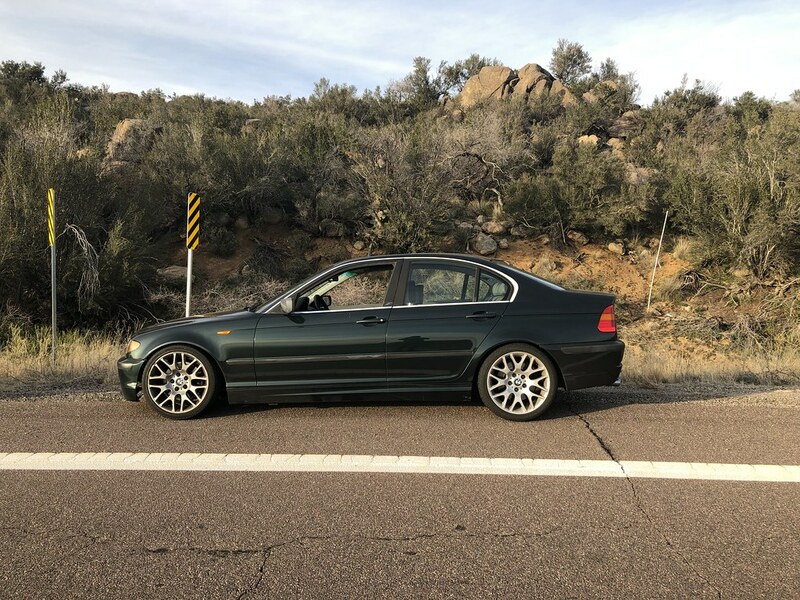 Overall though, the 330i was awesome today— it handled twisty mountain roads and 80mph highway cruising superbly, and it was even more comfortable with the X5 seats that I put in the other day. I really need to polish the headlights and condition the black trims, that's the last real eyesore on the car. I think those lenses are too far gone to look great - might I recommend replacing them? Thankfully our sedans have replaceable lenses. I do eventually want to replace them, but the priority right now is maintenance and getting new front tires... cosmetic stuff has a low budget at the moment. I have a DA polisher, pads, and Plast-X, so I figure I'll give polishing a shot just to clean it up in the meantime. FCP Euro sells a pair of new lenses for like $100, so I'll bookmark that and buy it in the future. 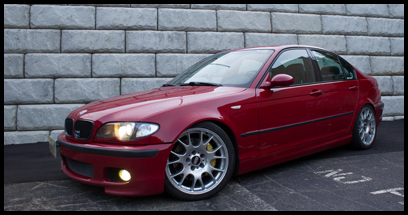 It's cool to see so many Russians on here, haha— I didn't see any in the other E46 forums I'm on. Reading through Dario's past threads and the thread for this car, we have a similar mentality to maintenance and whatnot. The main difference is that I keep my cars for a long time and I spend all of my money and time on them, since I don't have much else going on in life.